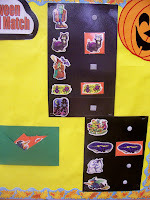 A few years back I went to a workshop and we were introduced to the interactive bulletin board. The leader was explaining how much the children enjoy being a part of their room's surroundings, decorating, or even using something only the teacher usually uses. 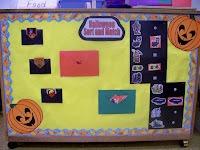 Then she talked about these bulletin boards. These can be games they can play or something that they can decorate themselves for a theme. October is the first month we put up one of our boards. One of our Pre-K teachers came up with this fun game for them to play on the board. 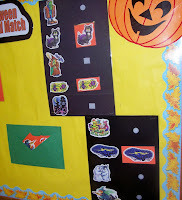 It is a Halloween sort and match game. One side of the board has a sorting game. There are three different types of cards and three pockets. 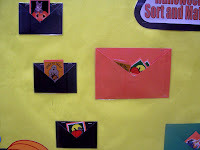 The children sort the cards so that each pocket has one type of card in it. The other side of the board has a matching game on it. All of the characters are mounted with a piece of velcro next to them. Then there is a pocket with all the characters in it. The children take the characters out and velcro them next to their match. They have a lot of fun with this. Next month we make a turkey. On the board I have the body of a turkey up, but he has no tail feathers. Around the turkey I have pockets of white feather drawings--each feather is about 6 inches. The children will pick out a feather, color it as they wish, cut it out, then it is put on the turkey. He is quite a proud turkey by Thanksgiving. I don't have any pictures yet, but I'll try to remember to post one in November. We do others, but I hope this gives you a general idea. It's really fun for them. Dear Farmin Family I hope you get this. I have been trying to return your email, but it keeps coming back to me stating that this person is not accepting emails from this address. I compiled a list of all the interactive boards I have on the site. If you get this, please let me know how to get the email to you.